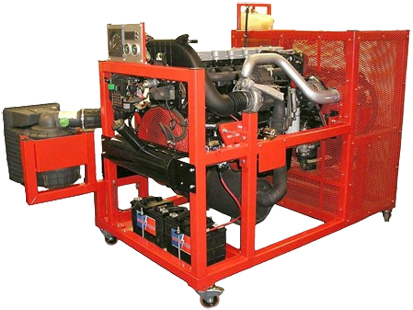 This trainer provides the instructor with a complete working 4-cylinder heavy vehicle diesel engine with a Bosch EDC engine management system and high-pressure common rail fuel injection system. The system comprises all the elements that control the air-fuel ratio, fuel injection, and exhaust emissions, together with the Bosch ECU and all the sensors and actuators associated with the control system. The system has manually-inserted faults that allow the instructor to demonstrate troubleshooting techniques on a fully operational engine. Pin out facility on all electrical components using 2 mm sockets enabling 'real-time' values to be taken without compromising the wiring harness. Includes Fault Insertion Module (Ten faults, Lockable). Fitted with manufacturer diagnostic socket.